ROME, 23 November, 2018 - The Rome Declaration was adopted today by representatives of 55 countries at the close of the European Forum for Disaster Risk Reduction. The Declaration was read out by Italy’s Deputy Minister for Foreign Affairs and International Cooperation, Emanuela Claudia Del Re, at the closing ceremony and spells out the challenges and opportunities facing the region as it seeks to reduce disaster risk and disaster losses. In herclosing remarks, Minister Del Re emphasized the importance of implementing the SendaiFramework for Disaster Risk Reduction in coherence with the Paris Agreement on climate and the Sustainable Development Goals. The UN Secretary General's Special Representative, Mami Mizutori, in her closing remarkst pointed out that the Italian Prime Minister, Giuseppe Conte, was the first Prime Minister to open a European Forum for Disaster Risk Reduction. "His presence, his words and the actions his government is taking to reduce disaster risk speak volumes for the level of political commitment there is in Italy towards achieving the targets laid out in the Sendai Framework for Disaster Risk Reduction," she said. 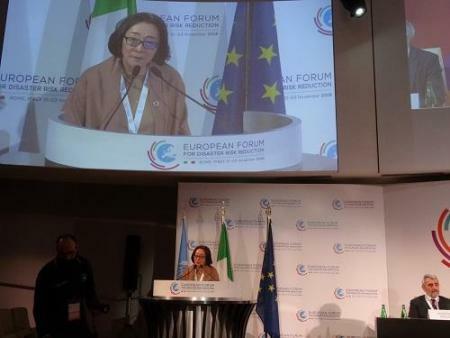 The head of UNISDR’s Europe Office, Paola Albrito, noted again the presence of Italy’s Prime Minister, Giuseppe Conte at the opening of the European Forum and welcomed this as an important statement of political commitment to disaster risk reduction.Ms. Albrito also said Europe was a particular source of innovation on disaster risk reduction especially in the area of pursuing measures for sustainable finance with greater emphasis on risk informed approaches to investment by the private sector.EU Commission representative, Nacira Boulehouat, praised the European Forum’s multi-stakeholder approach and the diverse range of participants.Ms. Boulehouat also welcomed the focus on disaster loss data collection for improving disaster risk management and promised continued support to implementation of the Sendai Framework both inside and outside the EU.Gianluca Silvestrini of the European Council, praised the high level of stakeholder engagement and called for greater participation of politicians in future European Forums.In his closing remarks, Angelo Borrelli, head of Italy’s Civil Protection Agency, highlighted the importance of good communication and coordination across government departments to enable faster response times to disasters and improved management of disaster risk. Mr. Borrelli also stressed the need to address the challenge of ageing infrastructure which is addressed in the Rome Declaration. At the closing ceremony it was announced that Portugal will host the next European Forum on Disaster Risk Reduction in 2020.